Japanese knotweed is easily distinguishable with its shield-shaped leaves, purple-spotted bamboo-like stems and small, creamy white flowers, which should be appearing over the next few weeks of late summer. Follow this link for a handy Japanese knotweed identification guide. The plant is not native to the British Isles and as such it is not exposed to any of the controlling organisms that maintain it to its natural extent in Southeast Asia. With the absence of controlling organisms (such as bacteria, fungi and invertebrates) and climate, and with the ability to occupy a large amount of space in invaded habitats, the plant has been able to cause significant damage to native ecosystems, including competitive displacement of native vegetation and associated fauna, increasing risks of soil erosion and exacerbating flooding through the impediment of water flow by its dense stands. Below is a brief run-down of Japanese knotweed’s effects on ecosystems. 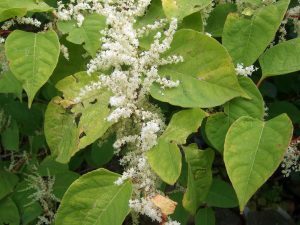 Biodiversity: Japanese knotweed affects ecosystems by outcompeting native vegetation and limiting species diversity, and is therefore widely attributed to causing reduced species diversity in both flora and fauna. Water quality and flood risk: With dense canopies of leaf in the summer, Japanese knotweed can cause shading of small streams, and intercept rainfall channelling it elsewhere. In the winter canes can increase the erosion of river banks as the growth dies back, causing siltation, and can reduce the capacity of river channels by forming blockages and dams causing floods, as well as blocking vital flood infrastructure such as sluices, drains and ditches. Recreation: Most obviously Japanese knotweed can be a blight and a bane to gardeners and allotment holders alike, but the plant can also negatively affect anglers, as it can obstruct access, shade rivers and lakes, and cause damage to banks as mentioned previously, while negatively affecting water and fishing quality. Other water users such as sailors, rowers and canoeists may find the dense stands a barrier to entering the waterways, and during the winter months the dead canes can become visually unappealing and can block views. It is for that reason that Japanese knotweed should be treated and managed by fully trained professionals whether you own an affected domestic property or manage a commercial property or development site. Phlorum are founding members of the Property Care Association Invasive Weed Control Group (PCA IWCG) and the working group that produced guidance for the Royal Institution of Chartered Surveyors (RICS) on surveying Japanese knotweed and assessing its risk to residential property. We are one of the UK’s leading specialists in Japanese knotweed removal solutions, with offices across Great Britain. Our range of expertise includes undertaking Japanese knotweed surveys, a variety of comprehensive removal treatments tailored to individual clients’ needs and requirements, guidance on removal of Japanese knotweed, legal advice, and advice on how to conduct your own DIY treatments if you’re feeling brave!